It’s winter where Club Creative Studio is located and it’s cold. It’s time to enjoy a little taste of bead soup. No, I have not decided to actually EAT, sleep and breathe beads no matter what others think that I already do. 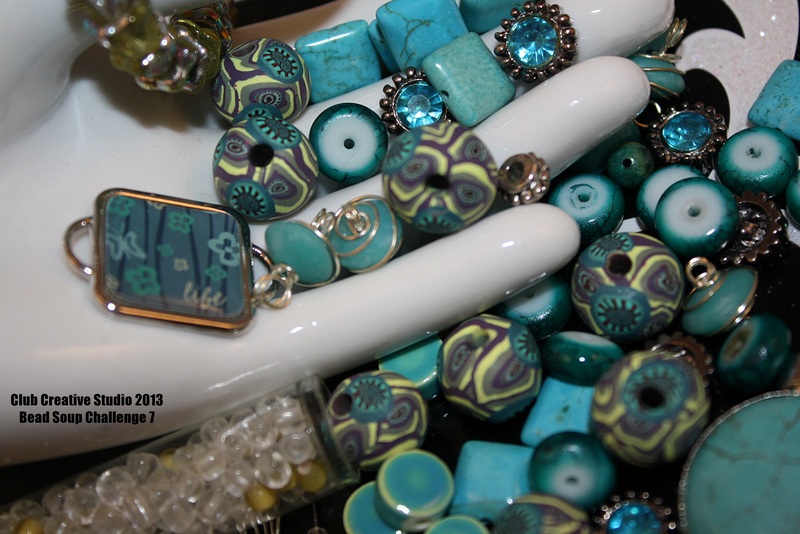 I am taking part in a beading challenge called Bead Soup founded by artist Lori Anderson. 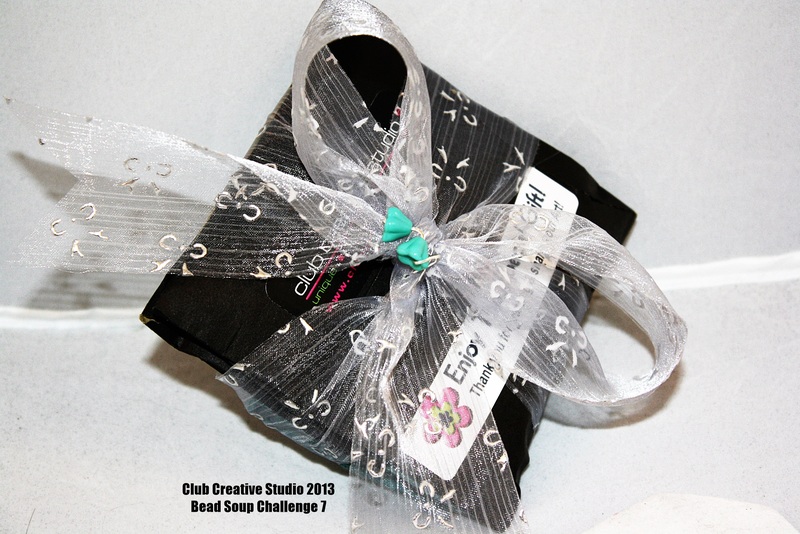 This bead soup challenge pairs up persons creating hand-made beads and places them in a challenge together where they put together a goodie package and mail them to each other, challenging them to create from the stash. 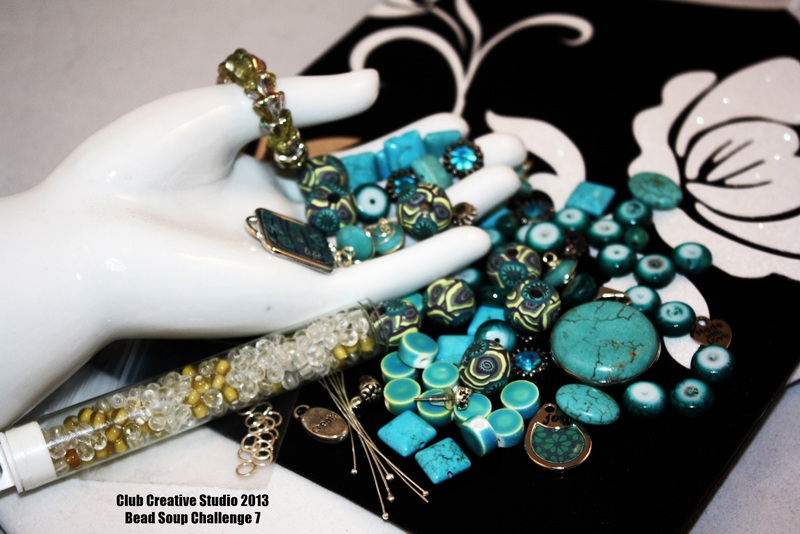 This challenge has three separate reveal dates so that bead artists have time to complete their projects. Most like me, plan to document the journey. This is the first time that I am taking part in this event. I first got word that my “Bead Buddy” Susan was from New Hampshire a few days ago. We have a means to communicate and keep in contact throughout this project. The full content of our packages are supposed to be a secret until they are received by mail. We are allowed however to give sneak peeks or “teaser photos”. These are two photos that introduce with curiosity concerning what I have included for this challenge. When I asked Susan for a hint of what she was going to send me in her package, she said with a bit of wit and humor that my beads all had holes…included something old, something new, something purchased, something hand-made, and something blue. Hummm…I can hardly wait! My reason for taking part in this beading challenge is to experience a creative challenge and go through my steps of creative thinking with beads sent to me. I am also in total support of the artist paired with me as I am of all of the artists also taking part in this creative process (which totals over 500 participants). They all eagerly use their creativity and talent to make hand-made beads and share with others for artistic growth. Please stop by this blog often as I continue to share photos and information about how my first Bead Soup challenge is going. I am ready and willing to enjoy my Bead Soup and share it with you. It is no secret that creativity is a form of expression. Have you discovered the reasons why creativity allows you to express yourself? There may be several reasons why allowing creative thoughts and actions into your life can benefit you. In today’s Club Creative Studio’s blog post I want to touch on few aspects explaining how creativity can help you define who you are. While it is true that “you are you” as a unique being and you are capable of expressing your individuality in several ways, how you express your creativity is where being creative comes into play. Being creative and allowing yourself to be true will give you the chance to express yourself to the fullest. Let’s say you are naturally a shy person. There is nothing wrong with having this quality at all, I am thinking of a word that has a reference to a characteristic many seem to want to overcome in some degree level. Some people wish they were more outgoing, more brave and daring, louder, more showing of self-confidence. Whatever the challenge we see as a potential shortcoming which by we identify with for any reason, I believe that by adding creativity into the mix, we allow ourselves to tackle those challenges more readily. Art therapists will probably be among the first of many to tell you that the use of art in many forms will free you of many things. I too believe in the power of art as a means of expression and a break through to many situational problems or concerns. Letting out what is inside is a release of sort that can have a healing and revealing process associated with it. Do you know how being creative can benefit you? 1. Release. Using creativity as a means of release can free you up of unwanted stress and tension. Free your mind of worries for a bit, or share what is considered over-load information in a different venue. 2. Answers an Inner Need. Being creative allows you to be satisfied with the needs that you have to express what your imagination fosters. Do you have a need to be expressive and share your inner thoughts? No matter if a creative need is expressed to yourself in a private journal entry or sung out loud to the roof tops, creativity can call upon your inner needs and be filled. 3. It’s Natural. It may not seem that way sometimes but, we all have the potential to be highly creative. 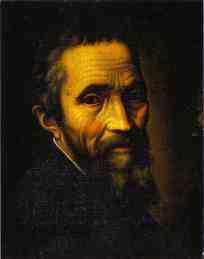 It is only when we become older that we lose sight of how easily creativity can flow because of all of our hang-ups. Being creative can become automatic and freeing we can appreciate the natural built-in drive to strive to be creative we already have, naturally. Creativity is natural and it is contagious. Creativity begets Creativity. 4. It’s a Brain Game. Looking at creativity growth as a personal challenge is a way to increase it with intended purpose. It takes practice to be creative without having to think about what you are doing. The more times you are calling upon yourself to think or act on a creative thought or impulse, the faster those opportunities appear when you need them the most. Your out-of-the-box thinking concepts will become more frequent when you train yourself to be more expressive and imaginative every chance you can. I believe being more creative can become a personal challenge and attainable goal. Practice of anything will bring about a change. 5, Shake It Up. Expressions of creativity shakes up our senses. Adding a new view to a situation, a twist on a solution, or a vision of enlightenment stemming from a creative thought adds spice to life. Even if you are not the one being creative but you are listening to a creative person or thought, their creative actions or words can inspire you to act in a creative manner as well. 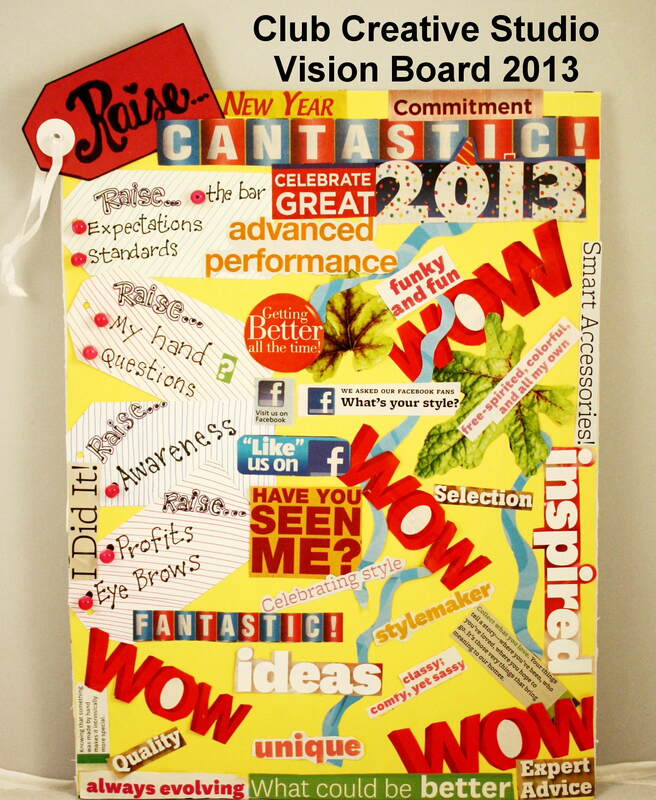 Why not use creativity to shake up your world? The world needs MORE creative thinkers. We need different solutions, we desire our days to be exciting and worth remembering. When creativity shakes up and changes something, we take notice. If creativity or calling upon your creativity is not your strong suit, I guess I made this list for you in mind. If you can find one of the numbers helpful to inspire a creative spark and reason to be creative today, I’d love to hear about it by a comment below this post. Have a great day being “Creative Everyday”! The Club Creative Studio blog today has a focus on five of the top reasons why I believe this is true. Can you think of anything to add to the list? Being creative demands that you “put yourself out there”. It takes bravery to express yourself as an individual. Being creative explores unknown results. Courage is needed to chart unfamiliar territories and step outside the box. Being creative requires a level of risk. Creativity has a risk of failure and success. Creativity is a give and take experience. Creativity gives satisfaction to self and others. Creativity also includes a part of the creator’s soul. Creativity has an element of investment. Being creative uses invested supplies and a time commitment. These are the very reasons among others, that I am dedicated to Being Creative Everyday! It is not easy to be the one that always stands out in a crowd. But, it is probably the most satisfying result of having courage to create. Expressing uniqueness is something that anyone can learn to be comfortable with. When a creative person sits down to focus on a task at hand, they do so with the thought that the results are going to be unpredictable. I love knowing that my creative endeavors are all part of my wonderful journey. The path can take on twists and turns as fast as the ideas spark. The exciting part of creativity is that it can evolve and proceed in many new directions. Being creative always as an element of risk involved. I know that my success and failure rates are experienced in record amounts. Creativity is a learning process. It is an expression as unique as the individual. While any creative person dedicates a part of their soul to their art, creativity does not always take away from the creator. Creativity expressed and shared gives greatly to those willing to receive and reach out to connect with another’s creative ways. For me, Being Creative Everyday is not only my personal and business model canvas mantra, it is also a means to the end result of being the best I can be in creating art and sharing it with others. My hope for you today is to find a way to be creative and thrive in your own level of creativity. The spirit of creativity lives within you, find what it takes to spark it, and see what it can do for you! Believe it or not, being more creative can allow you to also be less stressed. Having a creative outlet opens your mind and eyes to new and exciting ways to distress. What’s your creative stress buster? I use the opportunity to be creative with art on a daily basis. In this TNT (This-N-That) Club Creative Studio post I’d like share ideas why creativity can come to the rescue in times of stress. My personal and business mantra is Be Creative Everyday! Having this frame of mind has allowed me to use the arts as a means to be expressive and less stressed in my day. Focus your mind and hands creatively and you are in for an escape (of sorts) of reality. Being creative takes my thought process to a different out-of-the-box, critical thinking stage. It helps me forget about the other things that are stressors in my life. When I am creative, my focus changes to thinking in nonconventional means and I allow myself to grant freedoms of imagination and growth from routine. Being creative sets my mind free from rules and places me in a state of experimentation. Gifting the opportunity to ask and act upon questions like “what if”. Recently, I had the misfortune of having technical difficulties. Within two days of each other , I discovered that I laundered my cell phone and the motherboard of my computer was fried. Talk about some bad luck. 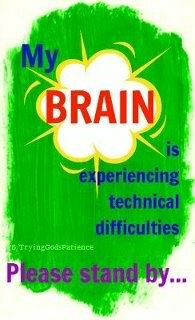 My technical difficulties were woes that I had to solved quickly so I could get back on track to where I needed to be personally and in my business. Those are stressful times, when you have to worry about a cost associated with a solution, as well as the time you are going to sacrifice to get back to your normal life when there is a challenge in your mist. Creativity gave me comfort. Creativity was the sweet diversion from my problems. Creativity gave me something else to concentrate on while I waited for the outsourced help. In this instance, I had gained time to be more creative because I was not directly involved with my main concerns. You can use creativity as a crutch to help you become stronger in critical thinking skills and thinking differently in general. I think that stress become less prominent if you inject some level of creativity into each situation. Creative thoughts sure take the routine out of the day, allow your personality to shine, and gift others with alternative points of views. We were all meant to be indivuals and I can think of no better way to express uniqueness than to show your creative side. Give the gift of creativity to yourself or others today and find out if it will serve as a stress buster technique for you in the future. Here’s a TNT (This-N-That) Club Creative Studio riddle for you. Question: What do you get when you place two jewelry makers with different design styles together in the same bead store for a few hours? Answer: A few long receipts! 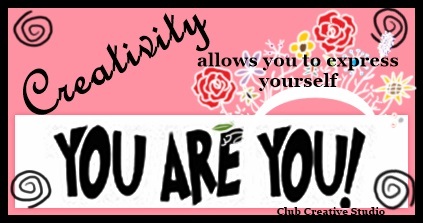 Welcome to the Club Creative Studio blog where the focus is on CREATIVITY. 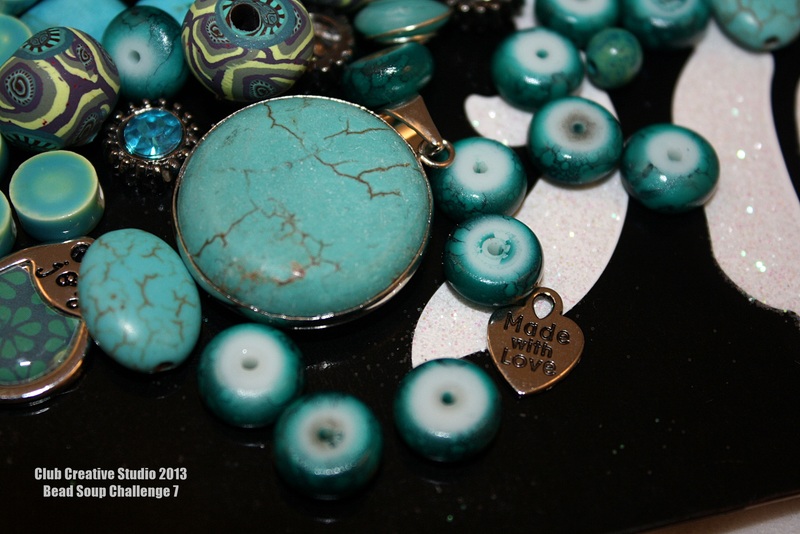 I recently blogged about a small bead shop that was closing its doors for public business. I learned that after eight years, the owners wanted to start reclaiming their lives and go fishing and enjoy and be near their grandchildren more often. One can hardly argue with that! It takes dedication and many hours run a brick and mortar storefront and I totally understand their desire for a change of pace. It will be a loss to many bead fans and jewelry-makers to no longer have the store in their neighborhood. In their final days of their close-out, they offered a great opportunity for customers to purchase their remaining tiny treasures at deeply discounted prices. I hit the bead store scene with a new bud to buy beads and we enjoyed our productive day. 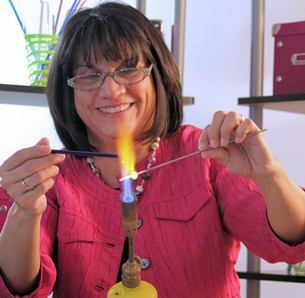 I had a great time talking the “language of jewelry-making” with a fellow jewelry maker and friend: Anna Servati of Anna’s Jewelry Designs. We first met at a networking event and quickly started speaking our native language BEADS. It is always a thrill for me to be able to meet or maintain a working relationship with someone who has similar passions and high levels of creativity. We have very different design styles yet, we can still appreciate the same beads and techniques in the jewelry-making world. I suggested that when we both got home, we needed to photograph our “bead stash” from today. Here is Anna’s stash. She loves gem stones, and added some unique clasps to her collection. While shopping, we had moments where we both admired the same beads even though we may have bought totally different beads in the end. We did agree to both purchase one bead alike, however. This will be the bead that we will both use in one of our individual projects to see how each of us will create with it. 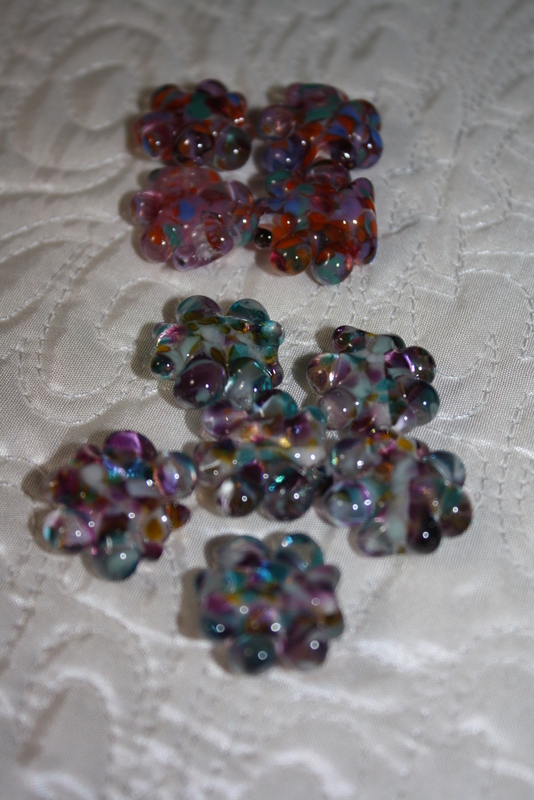 This is the special bead we each bought to use in our own separate creations. I wanted to use the photos to illustrate in this blog how two people can shop differently with their own personal art styles in mind, and let you see what caught our eyes long enough to want to purchase. My hope is to have you admire the collections and be inspired to do something creative. 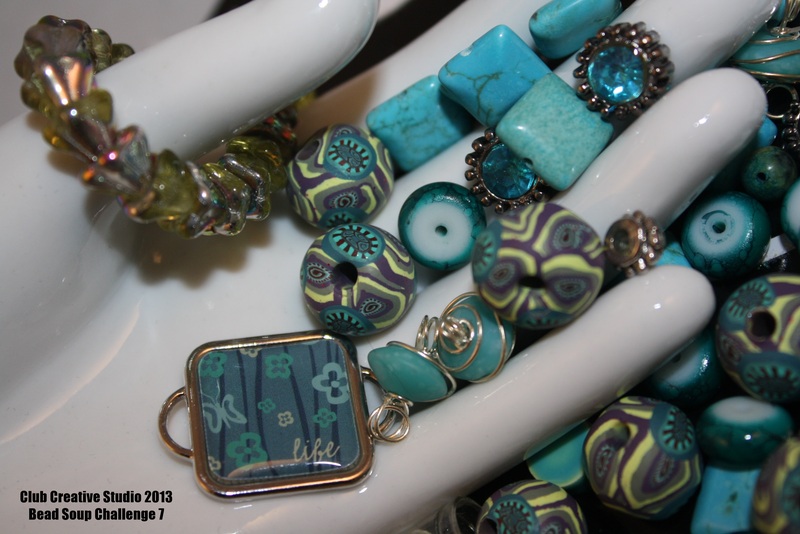 You don’t have to be a jewelry-designer to use or love beads, stones, charms or wire! This is my stash from the shopping adventure. You know I am always on the hunt for the unusual finding so leave it up to me to find the charms shaped like hands right off the bat as I entered the door! Some things just scream Club Creative Studio. 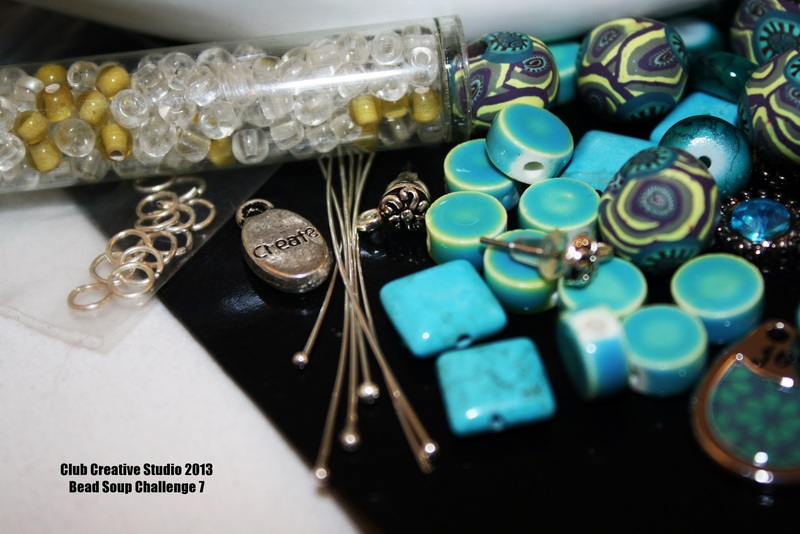 This is Club Creative Studio’s bead stash from 01/03/2013. The best take-away aspect that I realized yesterday while spending time with my friend was that while we had our little conversations in between our glazed over eyes in auto pilot shopping mode, we spent some quality time doing what I love to do…admire and inspire. The shopping spree also brought another aspect to the forefront of my mind. I feel that it is important to have at least one person that you can trust to have a listening ear near or word of honest advice when you need an opinion. I have many different “go-to” pals who are very knowledgeable in specific areas that are willing to share and have a give-and-take conversation. If you don’t have people in your life-like that, I suggest finding a few because there is nothing better than having the opportunity to bounce off ideas and get feedback from a variety of people. 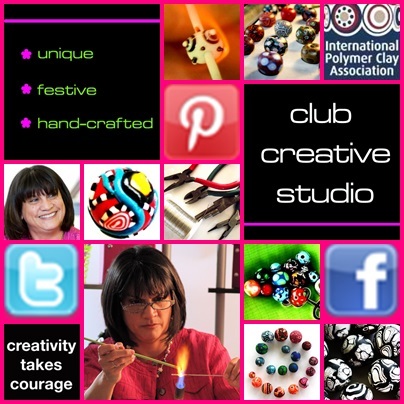 To view more interesting and unique hand-made items from Club Creative Studio, U.S.A. visit the website and check back often. You may see a creation that incorporates an item from this recent stash of goodies! Thank you for taking time to admire and be inspired. We love it when you wear and share Club Creative Studio hand-made ART THAT SETS YOU APART!